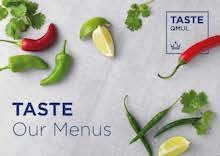 Taste QMUL is the identity of the internal event catering service within Restaurants & Hospitality QMUL at Queen Mary University of London. ‘Taste QMUL’ combines a passion for food with the experience of catering for a diverse, international audience. Whether a breakfast meeting for 10 or a gala dinner for 200, we use fresh, ethically and sustainably sourced ingredients. The menus within our brochure offer a wide range of catering solutions but we are equally happy to work closely with you to create an imaginative, bespoke menu tailored to your event. As part of Queen Mary University of London, we ensure unrivalled value and guarantee a service worthy of a university with a global reputation for excellence. If you have any questions, do not hesitate to contact us or to view some of our food, operations and events for QMUL, follow us on instagram @tasteqmul. The Room Bookings Policy for Non-Teaching Activity [PDF 62KB] outlines the process for booking rooms for events such as public lectures and conferences and all event organisers at QMUL should consult the policy when planning an event before booking rooms or facilities. The policy also explains the circumstances where charges for the use of rooms or facilities would be applied, and which teams are responsible for administering different types of room booking requests. The policy was revised in April 2014 to include two dedicated event categories for research conferences or workshops which are delivered in conjunction with an external organisation or body, but where the subject of the conference/event can be clearly aligned to QMUL research outputs.